Good News for Engineering graduates in Andhra Pradesh Andhra Pradesh PSC Assistant Executive Engineer Recruitment 2018 – www.psc.ap.gov. APPSC AEE 2018 Notification is out. 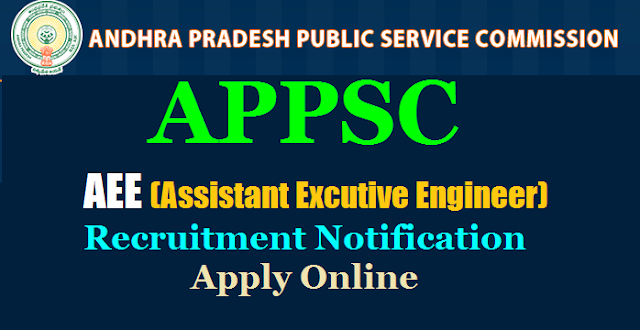 309 AEE Vacancies in various Departments of Andhra Pradesh Govt APPSC AEE Recruitment 2019 Apply Online, Andra Pradesh PSC Assistant Executive Engineers Notificaion 2018 Exam Patten, Syllabus at psc.ap.gov.in. 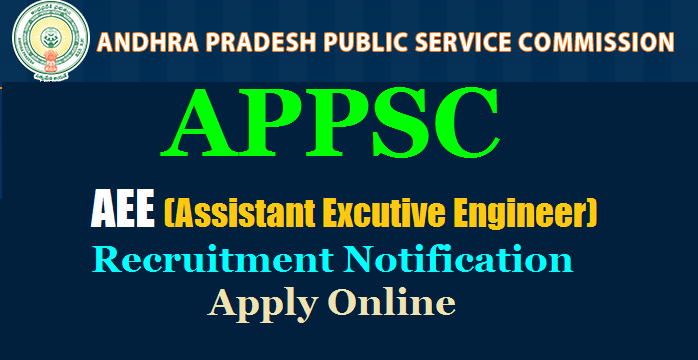 APPSC AEE Notification 2018: Andhra Pradesh Public Service Commission (APPSC) rolled out the recruitment notification for 309 Assistant Excutive Engineer Posts APPSC AEE Recruitment 2019 Apply Online, Andra Pradesh PSC Assistant Executive Engineers Notificaion 2018 Exam Patten, Syllabus at psc.ap.gov.in. Applications are invited online for recruitment to the post of Assistant Executive Engineers in various Engineering Services for a total of 309 vacancies in the scale of pay of Rs.37,100 - 91,450 from candidates within the age group of 18 - 42 years as on 01.07.2018. Before applying for the post, an applicant shall register his/her bio-data particulars through One Time Profile Registration (OTPR) on the Commission’s Website viz., https://psc.ap.gov.in. Once applicant registers his/her particulars, a user ID is generated and sent to his/her registered mobile number and email ID. Applicants need to apply for the post using the OTPR user ID through Commission’s website. The Commission conducts Screening test in offline mode in case applicants exceed 25,000 in number as per G.O.Ms.No.150, Finance (HR-I, Plg & Policy) Dept., dated:08.08.2016 and likely to be held on 10/02/2019. Instructions regarding offline examination recruitment test are attached as Annexure – III. Note: As per G.O.Ms.No.277, GA (SC & ST CELL .B) Dept., dated: 22.03.1976 and G.O.Ms.No.23 Backward Class (Welfare) Dept., dated: 18.03.1996 the Carry Forward Vacancies to be filled first by a relevant community candidate in succeeding recruitment. Assistant Executive Engineers (Civil) in AP Rural Water Supply and sanitation Department. (B) of AMIE Examination conducted by Institute of engineers in Civil. G.O.Ms.No.75, P R and R D (Estt-III), dated:06.04.2011. Assistant Executive Engineers (Electrical) in Roads & Buildings Engg. Service. Must possess a Bachelors Degree in Electrical Engineering of a University in India established or incorporated by under a Central Act, Provincial Act or a State Act or an Institution Recognized by the University Grants Commission or an Equivalent qualification or a Pass in Section (A) and (B) of the Institution of Engineers in Electrical Engineering. As per G.O.Ms.No.103 TR, R & B (Ser-II) Dept., dated:22.05.1996. Assistant Executive Engineers (Civil) in A.P. Water Resources Department. Must possess a Bachelor’s Degree in Civil Engineering of a University in India established or incorporated by or under a Central Act, Provincial Act or a State Act or an Institution Recognized by the University Grants Commission / All India Council for Technical Education or an Equivalent qualification. (As per AP Irrigation Engineering Service vide G.O.Ms.No.32, I & CAD Ser.IX Dept., dated:12.04.2010. Assistant Executive Engineers (Mech) in A.P. Water Resources Department. Must possess a Bachelor’s Degree in Mechanical Engineering of a University in India established or incorporated by or under a Central Act, Provincial Act or a State Act or an Institution Recognized by the University Grants Commission / All India Council for Technical Education or an Equivalent qualification. (As per AP Irrigation Engineering Service vide G.O.Ms.No.32, I & CAD Ser.IX Dept., dated:12.04.2010. Assistant Executive Engineers (Civil / Mech) in A.P Panchayat Raj Engineering Service. Assistant Executive Engineers (Civil / Mech) in A.P Tribal Welfare Engineering Department. Must be a Graduate in Engineering (Civil / Mechanical) from any University in India established or incorporated by or under a Central Act, Provincial Act or a State Act or an Institution Recognized by the University Grants Commission or an Equivalent qualification. As per G.O.Ms.No.67, SW (V) dept., dated:12.04.1994. Assistant Executive Engineers (Civil) in A.P Public Health & Municipal Engineering Department. Must possess a Bachelor’s Degree in Civil Engineering of a University in India established or incorporated by or under a Central Act, State Act or an Institution Recognized by the University Grants Commission / AICTE or a Pass in Sections ‘A’ and ‘B’ of AMIE (India) Examination in Civil Engineering. As per G.O.Ms.No.327, MA &UD (C) dept., dated:27.08.2012. STEP-II: The Applicant has to Login in the Commission’s website with the User Name (OTPR ID) and the Password set by Candidate. After Login, the Applicant has to click on the “Online Application Submission” present in the bottom right corner of the Commission’s website. PAYMENT PROCESS: The Applicant now has to click on the payment link against the Notification Number that he wants to apply. The Basic details required for calculation of the Fee and Age relaxation will be prepopulated from the OTPR data. The Applicant has to verify all the details that are displayed. Once the Payment form is submitted, the respective details (Used for Calculation of fee and Age relaxation) will not be altered in any stage of application processing. Hence if any details are to be changed, applicant should use the Modify OTPR link, modify the details, save it and again click on application payment link. STEP-III: After checking all the data and ensuring that the data is correct the applicant has to fill application specific data such as Local/Non Local status, White card details etc., which are also used to calculate the Fee. Once all the data is filled appropriately, the applicant has to submit the payment form. On successful submission, the payment reference ID is generated and is displayed on the screen. By clicking “OK” the Applicant is shown the various payment options where he/she can select any one among them and complete the payment process as given on the screen. STEP-IV: Once the payment is successful, payment reference ID is generated. Candidates can note the payment reference ID for future correspondence. Thereafter the applicant is directed to the application form. Applicant should provide the payment reference Id generated along with the other details required for filing the application form (other fields like OTPR ID and fees relaxations details will be prepopulated from the data submitted in the payment form for respective notification). The Applicant should check the data displayed thoroughly and should fill the application specific fields like Qualification details, Post preferences, examination centre etc., carefully and submit the Application form. Once the Application is submitted successfully then Application Receipt is generated. The Applicant is requested to print and save the application receipt for future reference/correspondence. NOTE: Applicant shall note that the data displayed from OTPR at the time of submitting the application will be considered for the purpose of this notification only. Any changes made by the applicant to OTPR data at a later date shall not be considered for the notification on hand. STEP-V: In any case if the payment process is not submitted successfully, then the applicant should start the fresh payment process as mentioned in STEP-II. 4. The main examination in online mode for candidates selected in screening test will be held through computer based test on 01/04/2019 FN & AN, 02/04/2019 FN & AN There would be objective type questions which are to be answered on computer system.